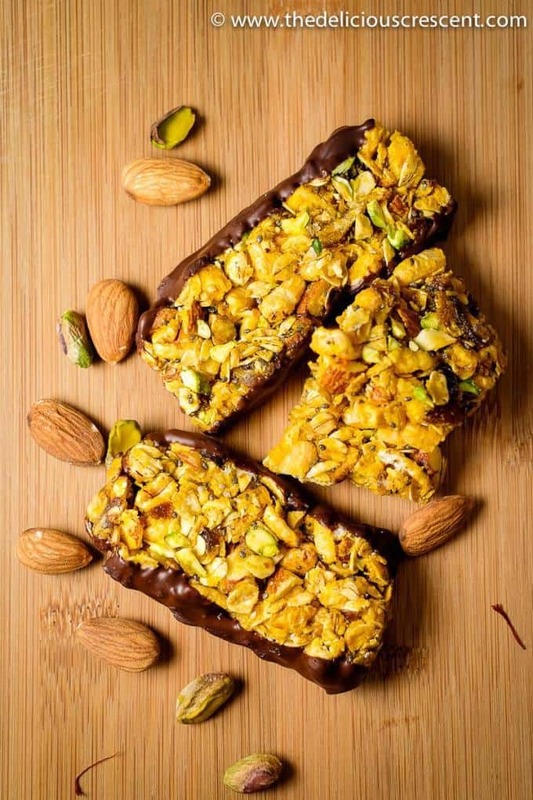 A granola bar is a snack food prepared with rolled oats, puffed cereals, nuts, honey or other sweeteners such as maple syrup, brown sugar and flavorings. These bars are often baked until toasted and golden brown, sometimes crunchy or chewy. They are a popular option for a quick breakfast, lunchbox treat or a snack. Are granola bars good for you? Granola bars are often considered a healthy treat by default. But not all granola bar recipes are actually healthy. It really depends on the ingredients. 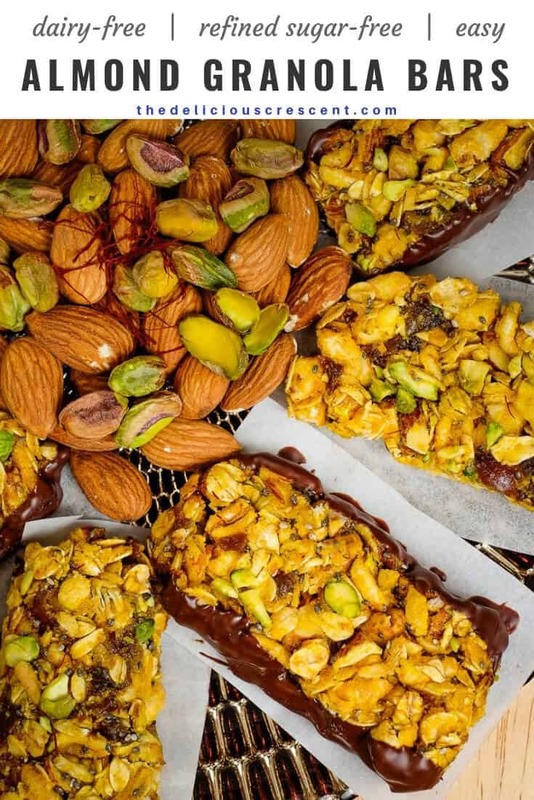 A wholesome treat such as these almond granola bars use all whole ingredients, not overly rich and with no artificial ingredients. Quite often though, granola bar recipes are literally calorie bombs loaded with rich ingredients. Those may work well for gaining weight. But if you are looking for a balanced and healthy treat, choose recipes that use a combination of grains, cereals and some nuts, dates, honey or maple syrup instead of refined sugar, nut butters instead of dairy butter. Using a combination of puffed cereal with rolled oats actually lightens up the granola bars by cutting down a little on the calories and carbs, since the puffed cereal are not as dense. 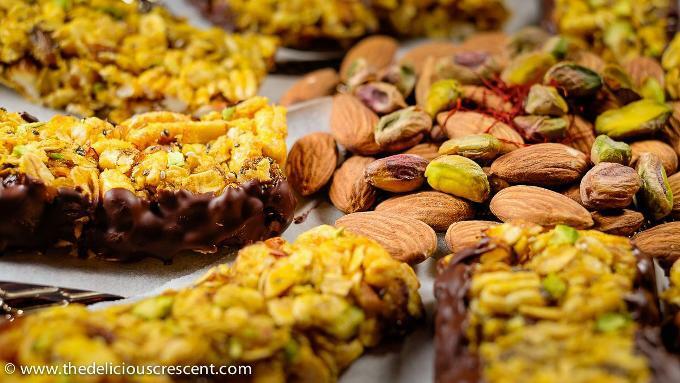 Are Homemade Granola Bars Healthy? Just because they are homemade they may not be healthy if they use artificial ingredients or too many rich ingredients. Good health requires balance and moderation. Use about 3½ to 4 cups granola bar mixture for one 8″ x 8″ baking pan . You can change the ratios of oats to puffed cereal, or even replace nuts with some chocolate chips. You may cut out the puffed cereal and replace oats. Extra nut butter can help make firmer granola bars that hold together better. Toast the grains and nuts for 10 to 15 minutes at 350ºF to enhance flavor and texture. You may soften the dried fruit such as raisins and chopped apricots by soaking the dried fruit in hot water for 10 minutes. Be sure to drain the dried fruit well and pat dry with paper towels before using. You can store granola bars in airtight containers. They can also be frozen in food safe freezer bags. If egg whites and rose water are used, it gives a more chewy and softer granola bar. Skipping egg white and replacing rose water with vanilla flavor results in a more hard and firm texture. Vegan: Use maple syrup instead of honey. Skip egg whites. Nut Free: Replace almond butter with sunbutter, and use sunflower or pumpkin seeds instead of almonds and pistachios. Other Options: Other nuts (hazelnuts, pecans, walnuts, macadamia, cashews), seeds (pumpkin seeds, toasted sesame, sunflower seeds), coconut and/or chopped dried fruit (apricots, cranberries, raisins) may be used. 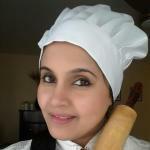 May substitute ground cardamom or cinnamon for flavors. Such an easy and healthy way to make delicious snacks! I love granola bars as a quick + healthy snack. Thanks for the tips on how to keep them packed together! Yes Kelly, I tried the recipe a few times and collected all the tips. 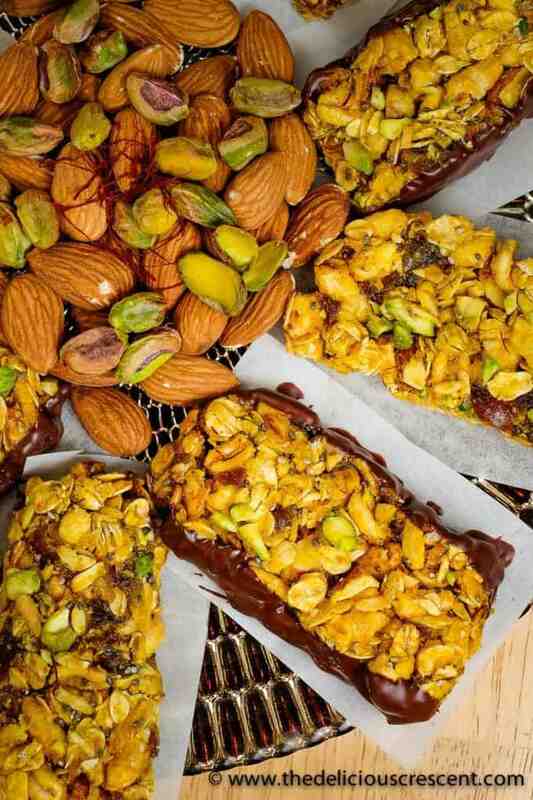 These granola bars sound delicious! Love all the healthy ingredients, and that they are refined sugar free. Hope you give it a try. Thank you! Granola bars are a favorite in our house, and I love making our own. Thank you for this great recipe! So happy you like it Jaclyn. Thanks. This is something I always buy from the store, but have wanted to try making at home! Thank you for the awesome recipe!! !